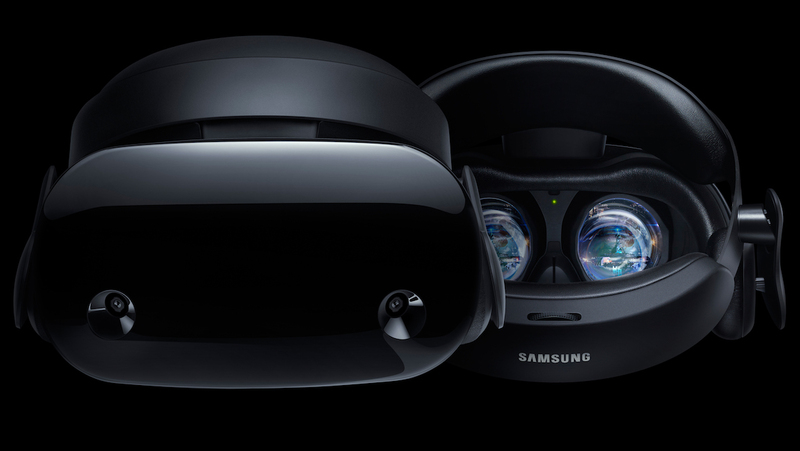 After getting its big reveal at Microsoft's Windows Mixed Reality event last month, the Samsung HMD Odyssey virtual reality headset is now on sale. Samsung has built the most high-end Windows Mixed Reality you can get, but it also comes at the price of $499, making it not only more expensive than other MR headsets, but also the Oculus Rift, which can be picked up for $399 with controllers. Samsung's headset also comes bundled with the Mixed Reality controllers, but where the Rift and HTC Vive require you to put sensors around the room, to make use of positional tracking, the Odyssey instead uses inside-out tracking. This means you can still move around in the VR space without plugging anything else in, making the setup a lot easier. Other Windows Mixed Reality headsets do the same - one of the appeals of the platform - but Samsung's also offering something we haven't yet seen in a Windows Mixed Reality headset: built-in audio. The Odyssey comes with attached spatial headphones from AKG, an arm of the Samsung-owned Harman. The Odyssey features two 1400 x 1600 AMOLED displays, which is an improvement over the 1440 x 1440 LCD displays typically seen in other Windows Mixed Reality headsets. Seeing as Samsung is one of the best AMOLED manufacturers in the world, it would be criminal for it to not take advantage here. You'll also be getting a 110-degree field of view with the Odyssey, making it one of the Windows Mixed Reality headsets with the highest field of view, on par with the headsets from Lenovo and Dell. Other Mixed Reality accouterments you can expect include a refresh rate of up to 90Hz and a built-in microphone. As evidenced by the price, Samsung is clearly targeting the high end of the Mixed Reality world here, packing in a whole bunch of features the other headsets don't yet - or won't - have. Alanna Cotton, vice president and general manager of Samsung Electronics, said as much at last month's event, explaining that Samsung and Microsoft wanted to craft a "high-performing headset". This is definitely going head to head with the Rift, Vive and PS VR. You can pick up an Odyssey on both Samsung's and Microsoft's sites, or in Microsoft stores.